The Mahalo U30 model is world's biggest selling ukulele an has now been totally re-designed and upgraded into this dazzling range - The Mahalo Rainbow Series! Regardless of your personality, the amazing colors let you scream your individuality to the world. 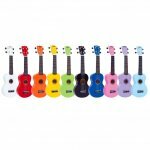 Available in 10 vibrant finishes, each Mahalo Rainbow Series Ukulele includes a carrying bag and represents an outstanding value! The Rainbow series includes state-of-the-art Canadian NuBone Extended Bass (XB) bridge saddles to increase projection and bass response as well as Aquila Nylgut strings to produce a fuller, louder and more balanced sound, rich in tonal harmonics. Learn more about Mahalo Ukuleles. Educational and bulk discounts available. Contact us for more information.